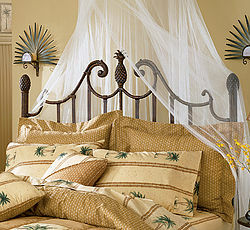 Banish the winter blues and feel like you’re on faraway shores by turning your home into a tropical paradise. The key to recreating a laid-back Caribbean look in your home is to take your inspiration from the island environment.. Bring a taste of the tropics to your own doorstep by filling your home with the textures, colours, patterns, and even fragrance of exotic lands. Natural colours and textures reminiscent of the beach (like sand and driftwood) can be incorporated into the scheme through your choice of flooring. Furniture is another way to bring in island-style textures and colours - try adding pieces in rattan or wicker and mix and match with plain wood furniture for a relaxed, informal feel. Next add colour - and be bold about it! Think sun-baked brights from Caribbean carnivals and beach house décor when painting your walls - a sunny yellow or chalky turquoise blue would be a good choice. Finally, go to town with your accessories. Lush green foliage really help this look to work. Finish off the look with coastal accessories - a toy sailing ship, hurricane lamp or even a hammock will really help to pull everything together. Now all you need to do is to pour yourself a cocktail... and relax! Retain the Romance of a Time Gone By with this Traditional Trunk by Woolrich Made of Poplar Wood, Wicker in Honey Stained Finish. Frame Features Hinged Lid Top. Antiqued Pewter Hardware. Decorated with Leather Straps that Enhance the Classic Feel. Overall Dimensions: 19Hx18Wx32L"